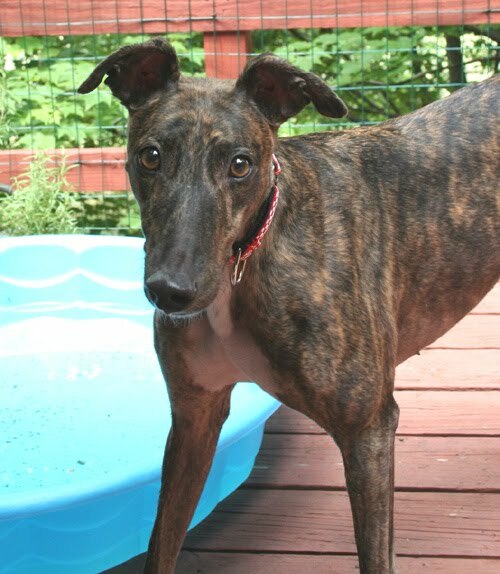 We are sad to report that another greyt adopter lost her beloved greyhound to a long term illness. Claire Exten has loved Lacey since she adopted her in July 2007. Lacey was adopted along with Rocky and the two dogs were constant companions. Along with Claire, they were a loving family sharing many good times together. Several months ago, Lacey became ill and traveled back and forth to the vet to be treated for a number of issues that never really amounted to a definite diagnosis. While at times Lacey seemed to feel much better and be “back to normal”, she would then get ill again and each time she would be sicker. Finally, the pain was too much for Lacey to bear and Claire had to make the very painful and difficult decision to continue on the same path with little improvements, or to end Lacey’s suffering. The last bout of illness took away any doubt and Claire released Lacey from her pain. Claire is devastated to lose a fairly young dog to an illness that was never diagnosed (but not from lack of vet care and trying). We know that Lacey had the best care and most love that any greyhound could get. While we are sad that Lacey is gone, we know that Claire gave her a most wonderful and loving home.